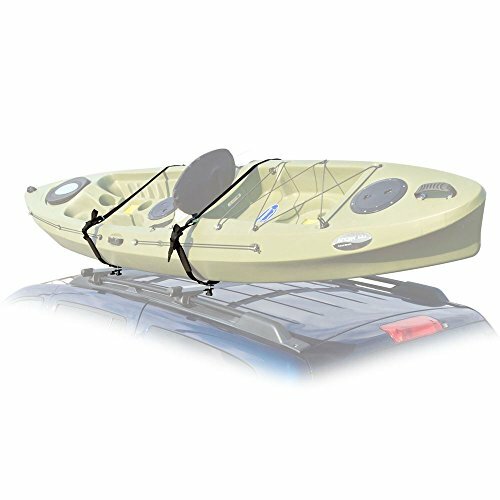 Apex J-Rack kayak carrier roof rack features a padded J-Hook cradle system that mounts to existing vehicle roof bars for transporting a single kayak or canoe to the next destination. The kayak carrier includes (2) cradles each measuring 16-3/4" x 1-3/4" x 15-1/4" overall, with (3) foam pads per support to protect the secured boat. Made for hauling a single kayak or canoe. Includes two 114" x 1" tie-down straps and necessary bracket hardware for installation to the vehicle's roof rack. Safety precautions and installation information: The kayak carrier rack works with square roof cross bars only. Requires at least 1-5/8" minimum height clearance from the vehicle's roof to crossbars. Requires cross bars between 1/4" to 1-3/4" wide by 1/2" to 1-1/2" high. Bow and stern tie-down straps are highly recommended to keep a kayak secured on the vehicle's roof rack during travel. Failure to use bow and stern tie-down straps may result in injury as well as damage to the vehicle and/or kayak.